Ingrown toenails (onychocryptosis, unguis incarnatus) are frequently encountered in both general practice and specialty clinics, and, thus, a fundamental level of understanding of the development and management of the condition, including knowledge of the nail anatomy, is useful. The nail plate, or the nail proper, consists of the body, which is the exposed portion, and the root, which is the proximal portion covered by a fold of skin called the eponychium. The cuticle is the most distal edge of the eponychium. The nail plate rests on a continuation of the stratum germinativum, called the nail bed. The nail walls are the segments of skin that overhang the lateral edges of the nail, which attach within the sterile matrix. The germinal matrix runs from an area just distal to the lunula to several millimeters proximal and deep to the eponychium. The germinal matrix is likely solely responsible for longitudinal growth of the nail. See Nail Anatomy for more information. The presence of a lateral projection of nail growing into the periungual soft tissue, commonly believed to be the sole etiology of ingrown toenails, is likely only one of several factors in the development of the condition. Although any toenail can become ingrown, the vast majority occur on the great toe. Extrinsic compression on the great toe by footwear places constant pressure directly on the medial nail wall and indirectly on the lateral wall as the toe is pushed against the second toe. In the presence of a nail that is cut inappropriately short along the lateral portion, the nail fold is irritated or penetrated, which allows colonization of bacterial and fungal skin flora. Inflammatory changes, including edema, erythema, and pain, occur as an abscess forms. With the formation of hypertrophic granulation tissue, the toe is increasingly exposed to compression and irritation, creating a vicious cycle. In the early stages of inflammation, attempts at nonsurgical management may be attempted. Treatment consists of gently dislodging the lateral edge of the nail plate from the inflamed nail fold into which it is embedded, followed by placement of sterile nonabsorbent gauze or cotton under the sharp corner of the nail. The patient should be given a cutout shoe and instructed to replace the gauze daily and perform warm soaks several times daily until the inflammation has subsided. Activity should be modified to minimize pressure on the toe. The patient must also be educated on proper nail care, which includes trimming the nail with squared corners that extend distal to the hyponychium. In the subsequent stage of ingrown toenail formation, in which the edematous and erythematous lateral nail fold extends well over the nail plate, abscess formation has likely occurred. Though it is less likely to be effective at this stage, nonsurgical management as described above may be achievable with vigilant care. All compression upon the toe should be removed, including socks or hosiery. Warm water soaks should be performed at least 4-5 times daily. Antibiotics are of unclear value but should be given in the setting of significant cellulitis or to patients who are diabetic or immunocompromised. Wound cultures may be obtained to direct antibiotic choice. Numerous alternative methods of conservative treatment have been described, including splints and commercially-available devices. [1, 3] Devices that have shown promise include shape memory alloys (SMAs), either of a Cu-Al-Mn base  or a Ni-Ti base. The point at which surgical treatment is indicated over nonsurgical management is not clearly defined. However, in the latter stages of disease, nonsurgical treatment becomes more time-consuming and uncomfortable and less effective. In advanced disease, evidenced by heavy granulation tissue formation accompanied by pain with walking, nonsurgical management is unlikely to suffice. As epithelium forms over the granulation tissue, drainage is obstructed and abscess formation persists. The excess inflamed tissue can no longer be lifted off the nail edge, precluding the nonsurgical management described above. However, patients may have a relatively asymptomatic chronic course that lasts several weeks with periodic inflammatory episodes. Total nail plate removal is rarely indicated. Partial nail removal is the preferred technique unless inflammation and abscess extend around the entire circumference of the nail. Significant granulation tissue formation, which precludes effective partial nail removal, is a contraindication. The procedure is also contraindicated in patients with chronic disease who do not require immediate relief. Definitive treatment for such patients may best be performed by a podiatrist. Given the limited amount of subcutaneous space within the toes and the relatively large area that requires anesthesia, local infiltration anesthesia is unlikely to provide adequate pain relief. Additionally, fibrous septa within the digit prevent the spread of the injected fluid within the subcutaneous tissue. Digital block can be performed with 1% lidocaine without epinephrine. The addition of bupivacaine provides extended duration of anesthesia. The skin surface of the proximal digit and adjoining web space should be cleaned thoroughly and wiped with an alcohol swab. Successful anesthesia requires block of all of 4 nerves. The 2 dorsal and 2 volar nerves are at the 2-, 4-, 8-, and 10-o'clock positions, in close proximity to the bone. Using a syringe (5-10 mL), a 27-gauge needle is inserted on the dorsum of the toe immediately proximal to the toe base at the web space, as shown in the video below. A small, superficial wheal is made at the location of the dorsal nerve, just between the skin and the bone. The needle is then advanced along the side of the bone to a location just volar to the bone. Approximately 1 mL of anesthetic is injected at that site; an additional 0.5-1 mL is injected as the needle is withdrawn. The same procedure can then be repeated on the other side of the digit. See the video below. Equipment is shown in the image below. 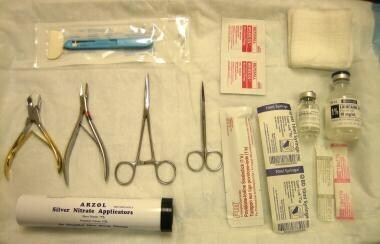 Equipment for ingrown toenail removal. The patient may be positioned supine or seated, with the foot extending to the end of the bed. The practitioner should be seated at a level such that the procedure can be performed comfortably without bending over. Partial nail removal can be performed by clipping only the offending distal corner or by removal of the entire lateral portion of the nail. Thorough cleaning of the affected area prior to nail removal is mandatory. When inflammation is limited to the area immediately adjacent to the distal nail wall without significant granulation tissue formation, removal of the distal corner of the nail may be sufficient. With an English nail anvil or similar cutting instrument, an oblique cut is made in the distal one third of the affected side of the nail. The nail is then grasped with forceps and extracted, as shown below. The portion of nail removed should be sufficient that no nail is in contact with the inflamed nail wall. The lateral quarter to third of the nail can first be gently lifted from the nail bed with a thin flat hemostat. Subsequently, the nail should be divided to a point several millimeters proximal to the eponychium with care not to injure the eponychium itself. If an English nail anvil is used to divide the nail, it should only be used on the distal half or two thirds. The remainder can be divided until resistance is no longer felt with small sharp scissors or scalpel for improved control. Underlying matrix that may still be attached should be gently removed with a scalpel. The nail fragment is then grasped with a hemostat and pulled out with a twisting motion toward the remaining nail as shown below. If substantial resistance is encountered, confirm that the nail has been completely divided and that no significant amount of matrix remains attached to the nail. Ensure that the entire nail fragment was removed by inspecting the remnant for any irregularities. The tissue exposed by nail removal should then be gently debrided. Maintain a bloodless nail matrix by applying a tourniquet around the proximal toe. The solution may then be applied with a moistened cotton-tipped applicator to the nail matrix beneath the lateral nail wall and the lateral portion of the proximal nail fold/eponychium. Three successive applications leave the cauterized tissue a gray or light brown color. Avoid exposure of phenol to the surrounding tissues and irrigate the area thoroughly after ablation to remove excess phenol and any remaining debris. A dressing should be applied to the resulting wound. The dressing, shown below, can incorporate antibiotic ointment and should consist of a nonadherent gauze dressing. The patient should be given adequate analgesics and instructed to keep the wound clean and dry, washing 2-3 times daily. The patient can expect some mild serous drainage initially but should be directed to return in the case of purulent drainage, worsening pain or swelling, or lack of wound healing after 2-3 weeks. Nonsurgical management of an ingrown toenail may be attempted in the early stages, prior to formation of granulation tissue. The recommended mode of treatment in the middle to late stages of inflammation is partial nail removal, which permits destruction of the lateral nail matrix and hinders recurrence. Digital block is the recommended method of anesthesia and requires that 2 dorsal and 2 ventral nerves be blocked. Ischemia caused by injection of excessive amounts of anesthetic during digital nerve block: The addition of epinephrine to the anesthetic increases the potential for vasospasm and ischemia, and most clinicians discourage this practice. Nazari S. A simple and practical method in treatment of ingrown nails: splinting by flexible tube. J Eur Acad Dermatol Venereol. Nov 2006. 20(10):1302-6. [Medline]. Chapeskie H. Ingrown toenail or overgrown toe skin? : Alternative treatment for onychocryptosis. Can Fam Physician. 2008 Nov. 54(11):1561-2. [Medline]. [Full Text]. Arai H. Formable acrylic treatment for ingrowing nail with gutter splint and sculptured nail. Int J Dermatol. Oct 2004. 43(10):759-65. [Medline]. Ishibashi M, Tabata N, Suetake T, Omori T, Sutou Y, Kainuma R, et al. A simple method to treat an ingrowing toenail with a shape-memory alloy device. J Dermatolog Treat. 2008. 19(5):291-2. [Medline]. Murray WR, Bedi BS. The surgical management of ingrowing toenail. Br J Surg. 1975 May. 62(5):409-12. [Medline]. Kayalar M, Bal E, Toros T, Ozaksar K, Gürbüz Y, Ademoglu Y. Results of partial matrixectomy for chronic ingrown toenail. Foot Ankle Int. 2011 Sep. 32(9):888-95. [Medline]. Yang G, Yanchar NL, Lo AY, Jones SA. Treatment of ingrown toenails in the pediatric population. J Pediatr Surg. 2008 May. 43(5):931-5. [Medline]. Kocyigit P, Bostanci S, Ozdemir E, Gurgey E. Sodium hydroxide chemical matricectomy for the treatment of ingrown toenails: comparison of three different application periods. Dermatol Surg. Jul 2005. 7:744-7. [Medline]. Ozawa T, Nose K, Harada T, Muraoka M, Ishii M. Partial matricectomy with a CO2 laser for ingrown toenail after nail matrix staining. Dermatol Surg. Mar 2005. 31(3):302-5. [Medline]. Fishman HC. Practical therapy for ingrown toenails. Cutis. 1983 Aug. 32(2):159-60. [Medline]. Reyzelman AM, Trombello KA, Vayser DJ, Armstrong DG, Harkless LB. Are antibiotics necessary in the treatment of locally infected ingrown toenails?. Arch Fam Med. 2000 Sep-Oct. 9(9):930-2. [Medline]. Rusmir A, Salerno A. Postoperative infection after excisional toenail matrixectomy: a retrospective clinical audit. J Am Podiatr Med Assoc. 2011 Jul-Aug. 101(4):316-22. [Medline]. Obscure Medical Terms: How Well Do You 'Speak Medicine'? Ingrown Toenails -- Straighten or Remove?